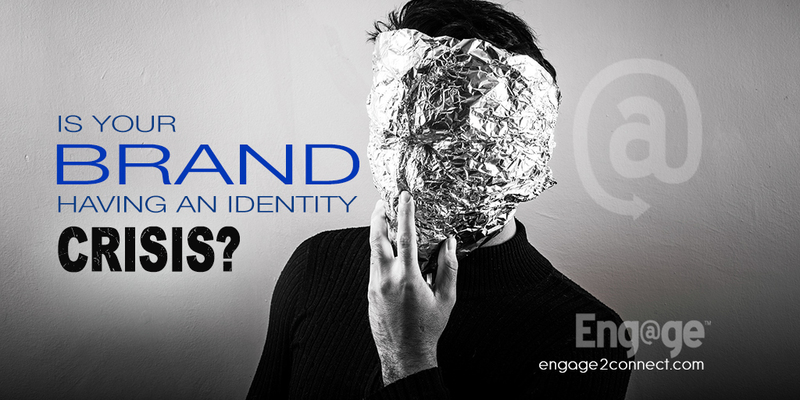 Is Your Brand Having An Identity Crisis? When someone is going through an identity crisis it is marked by that person seeking a clearer sense of self and an acceptable role within society, and is often caused by their confusion as to goals and priorities within their life. When it is something you are going through as a person it can certainly be traumatic and come with significant challenges and obstacles for yourself and those close to you. With a business identity crisis, it can impact all areas of the organization from marketing, manufacturing, operations, management, employees and all the way down to the customer and your target prospects. What Is A Brand Identity Crisis? First of all we want to explain that brand identity by itself is what your team as well as your customers think of your brand. What they believe you are, what you do and what your company stands for. When a brand is having an identity crisis, the company and its leadership is struggling to define who they are and what they do. This is a fairly common thing that startups deal with as they begin their companies and even for mid sized brands as they seek the next stages of growth. The most frequent obstacle for startups and SMBs to overcome with their brand identity is being so close to it. When you’re the founder or executive of a brand, you are so extremely close to its products and services that you can actually become the brand identity. This makes it very difficult to step far enough back to see and hear your brand how others do. 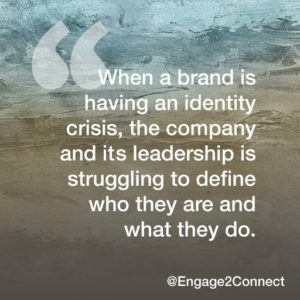 A brand identity crisis occurs when answering the question of who you are and what you do, becomes challenging for your company leadership and your employees. The result is that your messaging, benefits, marketing and branding are not clear to your intended customers and therefore they are not understanding what your company is or what you do. This can create a sales, revenue and marketing obstacle that can be wrapped in a tight little package we call a “Brand Identity Crisis”. When you are just too close to your own company, getting through your brand identity crisis might be more than you can chew. We find that many of the clients we work with are in that situation and really need outside insight and experience to transform the brand through the crisis. In short, if your brand is truly going through an identity crisis, you’re likely going to need some experienced assistance to push through the problems quickly and effectively. The process for solving a brand identity crisis usually starts with a considerable amount of research. The research required should be focused on several key areas. Investigation into the company itself, its products and services, history and current customers should always be the starting point. An outside third party perspective will uncover the information needed to answer who your company is and what it is that you actually do. 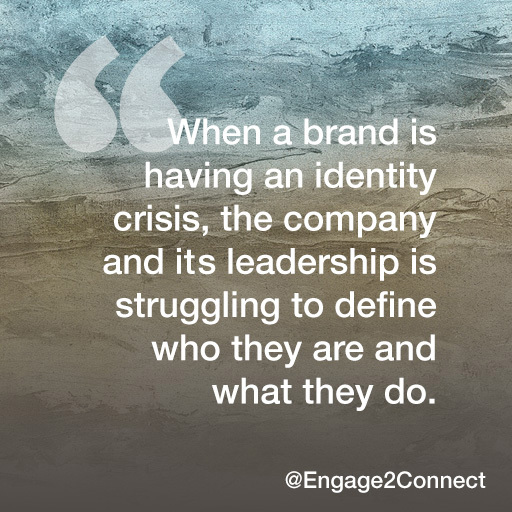 The fact is that if you’re actually in a brand identity crisis, you aren’t able to answer these questions well enough to formulate your customer messaging and experiences that would keep you out of the crisis to begin with. That’s what we do. Deep research into the industry that your brand is in, offers a substantial amount of data about where you reside within the industry itself. We are not talking about direct competitors, but rather the big picture market that your brand is a part of. This detail is crucial to solving your brand identity crisis. Outside of the general industry are your competitors. Though many startups and SMBs believe that they do not have direct competitors, the fact is you do. Uncovering all of the direct and indirect competition that is within the marketplace and researching their brands, marketing and penetration will offer key details that will be critical later in the process. Many brands think they know who their target customer is and yet they are frequently wrong. This fact is often why they are using incorrect messaging, have a brand identity crisis and not achieving the growth they need to be. Earlier in the process we conducted internal company research that included current customers, but at this stage we want to uncover what the accurate prospective customer is and what their real and direct challenges are that your brand solves for them. Lastly we must uncover how your brand and it’s products and services solve that prospective customers challenges. Moving past a brand identity crisis is going to require change and a lot of it. Sometimes this change requires burning everything to the ground and starting over from scratch. I’m not saying shut down the company, but rather that all brand components that are not working, from logo, to messaging to web properties are thrown out and then rebuilt. Now, like anything that is built, it requires a plan. That plan has to start with a solid foundation based on facts, data and information that can be relied upon. No contractor would begin construction of a new building without first having an architect design the plans that are safe, attractive and functional. Your brand identity must have that same solid foundation and a strategy that goes along with it. Using the the data obtained from the considerable time and resources invested in the research above a total brand and marketing strategy must be developed. That is the foundation upon which your brand identity will be built and grown. Just know that you are not alone. Many brands experience this kind of crisis in their lifecycle. It’s normal. Those brands that rapidly identify it and effectively get through, reap the benefits of doing so. Those that don’t are the ones that you see going out of business. It’s that crucial.